I hear you Doctor Shock Karloff I can tell is an idol of yours and mine also. I haven't seen this in probably 40 years it will definitely be worth adding to my DVD archives. This is without a doubt a "true" horror film. While I am at it I am adding the House on haunted Hill also. Great pick on the last show. Drew D.
Drew: Karloff is definitely an idol, and he consistently impresses me each time I watch one of his films. As much as I like Lugosi, there's little doubt that Karloff was the superior actor. 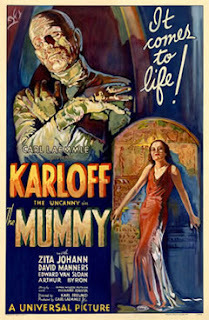 You certainly can't go wrong with THE MUMMY, or HOUSE ON HAUNTER HILL. Thanks so much for stopping by, and for listening to Planet Macabre. This post is not showing up off the "Horror" category Dr. Just so happens I thought it was weird that a post wasn't live yet today as I know you always have them out at the stroke of midnight, so I checked the Home Page and voila. Anxious to see the 14 horror movies you choose on this Horror Marathon you proposed on the Podcast. More Boris is always a good thing Dr., I am hoping for a few obscure titles though over these weeks. Chaz: Thanks so much for pointing this out to me! I got so caught up in our last episode, that I inexplicably listed this film under "HAMMER HORROR" in the tags instead of just HORROR! I'm in your debt. Actually, I'm kinda anxious myself to see what I come up with! I've still not planned out the 2 weeks (which is how I want it to be). Thanks again for pointing the error out to me. I appreciate it. Thanks also for your great comments, and for listening to Planet Macabre. Glad I could help Dr., it is the least I could do for all of the hosts providing such an amazing podcast for free to horror fans. Chaz: The pleasure is all ours! Thanks again. I'm glad you enjoyed the episode (and I'll also be picking up some of the other host's recommendations...I haven't seen most of them myself). Thanks for listening, and enjoy the movies! Great film and an awesome atmosphere as you aptly pointed out. If I recall correctly, the ending is a bit abrupt. In any case, I definitely need to re-watch.